Wheatstone’s new LXE console brings control surface configuration to a new level. Going far beyond the usual “any source to any fader” network concept, the LXE is a fully flexible control interface, where every switch and rotary control is programmable to perform any desired function. This means console architecture is completely customizable to client requirements, and limitations to functionality are no longer a factor. Physically compact, the LXE is available in several different form factors including countertop, countertop sunken, and split frames (split sections are not confined to one room, they can actually be in different studios). ConsoleBuilder software allows every switch on the surface to be programmed for function, mode, and even color (switches are RGB led illuminated). In fact, built-in software allows every button to be scriptable, letting you create powerful macros for as many controls as you want. Multiple full color OLED displays on each panel keep pace with ongoing operations, and event recall allows painless one touch console reconfiguration at the press of a button. With its inherent control flexibility and ability to access thousands of signals (sources and destinations are limited only by the size of the network) the LXE takes facility work flows and audio control to a new level. The LXE can have up to 32 physical motorized faders, with full DSP processing available on all 32 channels. Surface(s) interface seamlessly into the WheatNet-IP Intelligent Network, and utilize BLADE-3s for audio, control and associated logic data flowing on single CAT6 interconnecting cables. The system can ingest and convert virtually all audio formats: analog, microphone, AES/EBU, SPDIF, AoIP, MADI, SDI and even AES67. 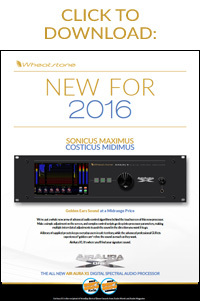 Loudness metering, phase control, and full EQ/Dynamics are included. LXE’s new GUI is has pre-built screens for everything you normally use – metering, clocks, timers, dynamics, EQ, assigns, and more. All are touch-screen accessible with gestures you’re used to using on your smart devices. And, the GUI is just as customizable as the LXE surface. Using our ScreenBuilder-LXE software, you simply drag and drop objects and define their functions via a simple wizard interface. You can store multiple custom screens, if you like, to go with your custom LXE setups. VoxPro, the only audio recorder/editor/playback system designed for live on-air operation, is absolutely indispensable to those who use it. It provides a unique set of software tools designed to record, edit and play back audio in real time, as well as a dedicated hardware controller that intuitively lets you get your job done with absolutely no fuss. It literally becomes a part of your routine. For VoxPro 6, we’re adding new features to let you enhance your productions. For instance, you can now, at the push of a button, simultaneously record audio while editing/playing back other audio. There’s a Gap-Buster function that automatically removes silence. Detach the Hot Keys panel and hide the Editor and File lists to reduce on-screen clutter. 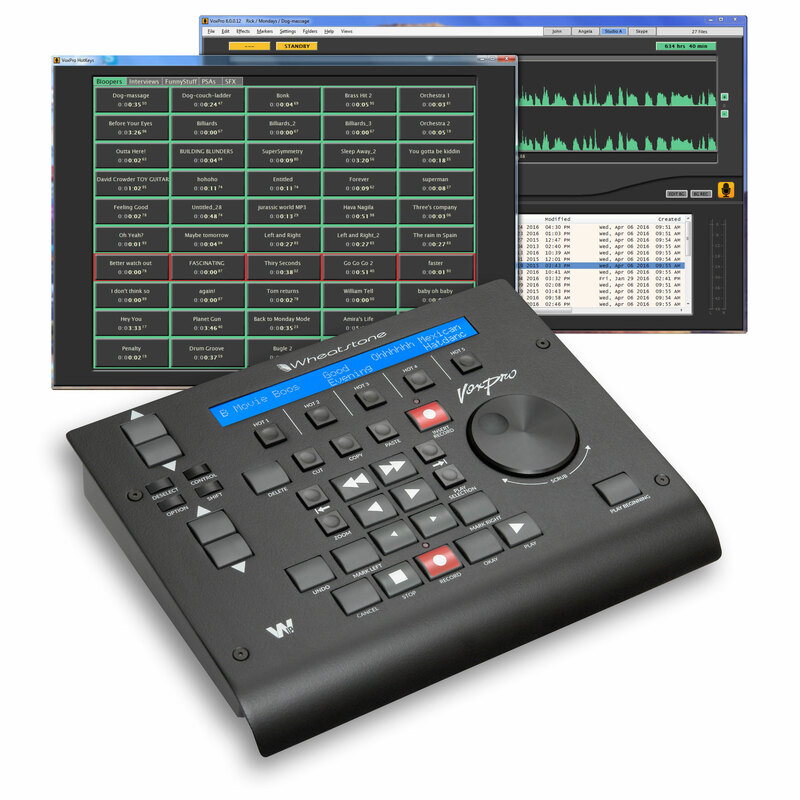 WheatNet-IP routing and playback tallies (with warning flash) let you control your network. And there’s foreign language Unicode label support, color-coded Markers, and plenty of user interface streamlining. We’ve put a whole new army of advanced audio control algorithms behind the touchscreen of this new processor. Make a simple adjustment on the screen, and complex control scripts go deep into processor parameters, making multiple interrelated adjustments to push the sound in the direction you want it to go. A library of supplied presets keeps everyday users in safe territory, while the advanced professional GUI lets experienced “golden ears” refine the sound as much as they want. AirAura X1. It’s where you’ll find your signature sound.